Jane Davidson, owner and trainer. Jane is an ABC certified dog trainer and a full member of the APDT (Association of Pet Dog Trainers), with experience in in-home training, group classes, behavior modification, and clicker training. She believes in positive training methods, and acknowledges that every dog and every family is different. She currently lives with 3 dogs, all rescue adoptions. Experiences with her own dogs led her to become involved in training and volunteering at animal shelters, and eventually to giving up corporate life to work full time with dogs. Have you experienced the frustration and embarrassment of a dog who doesn't listen to you? It has happened to me, and that's why I became a dog trainer! I used to work as an IT manager in large corporations. I was used to managing people, and managing supplier organizations. Everyone listened to me, and if I was not pleased, people worked to try and make things right. I had a wonderful dog, but I worked long hours so I thought she needed a companion, and I adopted a second dog. Suddenly, I found that my household was out of control! Most of the time, everything was fine, and we all got along well. If we had visitors, or went on a walk, the dogs stopped paying any attention to me. They barked, ran off, played and fought with each other, while I was a helpless bystander. People would try to avoid us in the street!!! With all my management experience and intelligence, I could not control two medium sized dogs. I was humiliated and frustrated. Based on our combined knowledge and experience, we developed a tried and proven recipe for success, whether you have one dog or several. We call this Seven Steps to a Dog Who Listens to You. Having a dog who listens to you is about more than just learning Sit and Come (although those are still important). It's about your relationship with your dog, structure and rules of the household, communication, and understanding your dog's needs and perceptions. At Eureka! our mission is to help you build a positive relationship with your dog. You can have A Dog Who Listens to You (even at the park! even when you have visitors!). Jane writes the Eureka! blog http://eurekapaws.wordpress.com/ with updates on topics we see from time to time in our business, as well as case studies of challenges presented by particular dogs. Jan Gordon, trainer. Jan Gordon has lived and worked with animals since age five. Jan's love for all dogs led her down the path of working in the animal rescue field for over 18 years. She is the founder of North County Animal League http://www.ncal.com/ – an animal shelter in Vermont – and has run shelters in Alaska, Vermont and Texas. Jan has years of experience working with dogs of different breeds, sizes and temperaments. Jan has experience in group classes, behavior modification, agility and tracking. She has also trained dogs for recreational dog sledding. Learn to Read Your Dog's Communication - your dog sends you messages all day long, but you may not receive them. Start with Your Mind - if you don't expect your dog to listen to you, why would s/he? Exercise and Stimulation - understand your dog's needs and why s/he gets over-excited. Set the House Rules - dogs love structure, and it helps them understand you are their pack leader. 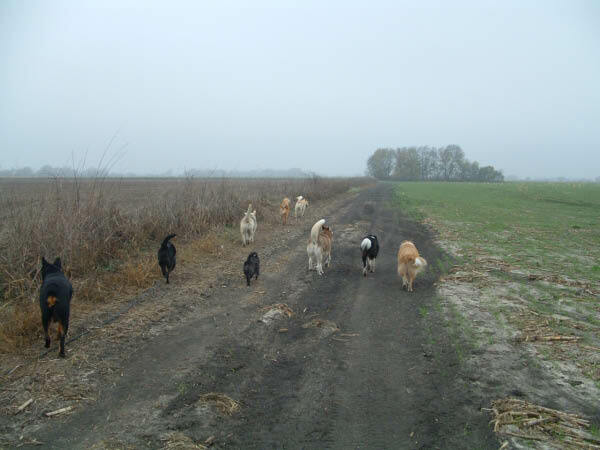 Use Your Walk - it's a bonding experience, it reinforces your pack hierarchy, and it's a coaching opportunity. Teach Your Dog Self Control - an over-excited dog cannot wait, stay, or leave things alone when you say so. Train Cues in a Specific and Structured Way - dogs need to learn in different environments, and they need small increases in difficulty. There are many wonderful dogs and puppies (pure bred and mixed breed) in shelters and at rescue organizations, looking for homes. Some had a home and lost it through no fault of their own; some were born to homeless mothers; some were handed in by families who could no longer care for them. If you want to include a new dog in your family, please consider one of these dogs. It is truly heartbreaking to see a young dog cooped up in a cage and unable to run because no one wants him, or an older dog abandoned and confused after years in a comfortable home. These dogs know what it is like to be unwanted – when they feel safe with you, they will reward you with a lifetime of loyalty.